Datevitation.com is the web's first online platform to create a custom lovey dovey coupon book. Coupon book? Pshhhh. No normal guy wants this. No way. This is NOT the gift for my guy. Well, you are wrong, Sister Kitty. Ross loved his because it related specifically to us and what we like to do together....or things we hope to venture out and do. Unlike the pre-packaged love coupon books on the market, you pick the dates and can customize the text. Keep it vanilla or mix it up with swirls. Once you are done customizing the text in your book, Datevitation will print it out and ship it straight to you...in a precious little box. Just drop it in a gift bag with a little bit of heart printed tissue paper. Done and done. I was contacted about this review & giveaway back in December. I thought, this would be PERFECT as a stocking stuffer for Ross. It was such a fun and personal way for me to create something that was meaningful to the both of us. They have a crazy amount of options to choose from. Type in whatever message you want. There are 200+ fun date ideas. A handful of x-rated ones are included. I opted to keep it clean. I know. So lame, but I got giggle out of reading the ones available. This is the perfect idea for Valentine's Day, anniversaries, birthdays, Christmas or as a "just because gift". Here are a few pages from the one I gave Ross. I couldn't show you them all. I mean, some of the dates are just for us to know about. (wink-wink). So, we are headed out to do a little two-steppin', gonna see the San Antonio Spurs whoop some b-ball booty and drink wine until our hearts are content...plus a few other special nights. How fun is this? Really? And these little stick figures...they are so happy, right? Luvs it!! Now, here is your chance to win your own custom book for the lover in your life. Valentine's Day is right around the corner. Don't show up empty handed on the February 14th. Already got them a V-Day gift? Well, that's cool. Just save it for his birthday or just give it to him because, well, you love him, by golly! Want to order one now? Enter the code SHANNA for $5.00 off your order. They start at just $20 and he will think you spent at least $50 on this goodie. Score and score. P.S. Don't forget about the $50 J.Crew giveaway going down. Can you click on this pretty little circle and vote for me? You can do it once every 24 hours until January 23rd. I'm indifferent! I want to hate it but can't help getting caught up in it every year! excellent [url=http://www.cheapoksunglassesuk.co.uk]oakley uk[/url] submit, very informative. I'm wondering why the other specialists of this sector do not notice this. [url=http://www.cheapoksunglassesuk.co.uk]oakley uk[/url] , You should continue your writing. I am sure, you've a great readers' base already! What? ?s Going down i am new to this, I stumbled upon this I've discovered It positively useful and it has helped me out loads. [url=http://www.cheapoksunglassesuk.co.uk]cheap oakley sunglasses[/url] , I hope to give a contribution & assist other users like its aided me. Good job. I don't love or hate it. I enjoy having a romantic night out but don't want either of us to give in to ridiculous gifts.....especially extremely over priced flowers. Ill tale those any of the other 364 days. Perfect timing with Vday! Love this! I used to love Valentine's Day because my dad would get my sister and I a card and one of those little heart shaped boxes of 4-5 chocolates. It was super sweet. Now that I'm a big girl, I'm not super into it. Sad. I love this Dateivation idea! Especially because I'm out of gift ideas. so agreee... hate the holiday! Love the holiday but there's too much pressure on us couples! I think let the kiddos trade cards and give me the candy, then let's call it a day! 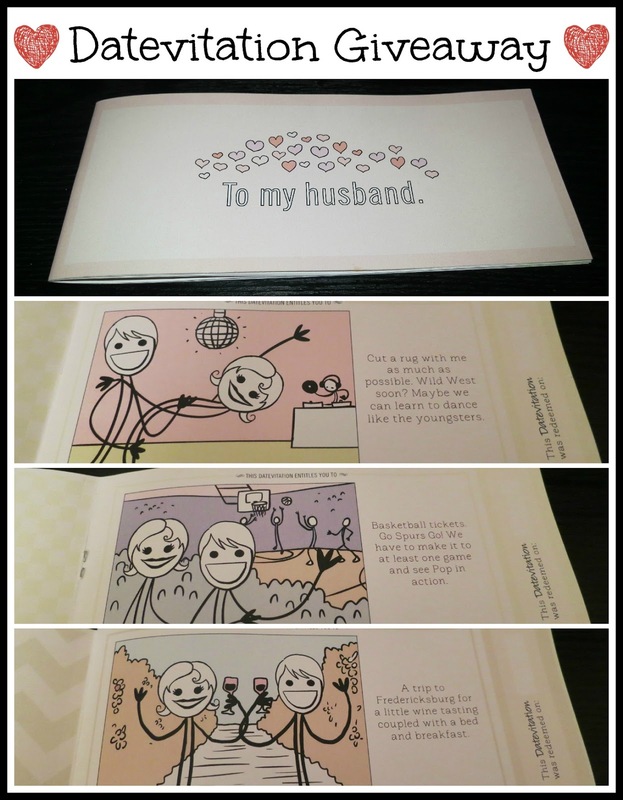 Valentine's Day isn't my favorite...but I really like the coupon book idea! Will def have to check it out! I love V day but have never had a good one! Maybe one of these days.. I NEVER enter these because I never win. But this time, I have a feelin'. And I'm totally ok if you rig it so I can win. I love that you are a Spurs fan too! I grew up in San Antone, but now I live in Dallas and I find fellow Spurs fans few and far between! V-Day isn't that great, especially now that we are married. It just seems kind of silly. I do like Valentine's Day, but I have to say it is overrated. LOVE Valentine's Day, but have learned it isn't as exciting for my husband. Therefore, this year I told him exactly what I wanted to do, and he was extremely grateful for my bluntness. I love it! It's such a fun holiday-- I think people take it way too seriously. The more cheesy the gift, the better! I'm pretty neutral about Valentine's Day. I don't expect anything crazy from my boyfriend - just a fun date. I'd rather get flowers & chocolate on a random day during the year than only on Valentine's Day though!